Richard Irwin (Belper, United Kingdom) on 6 February 2008 in Plant & Nature. Walking to the pub at sunset (this was on 28 January), I liked the colour coming back off this tall elephant grass in someones garden that I passed. Beautiful! The lighting you captured on the grass is gorgeous. Beautiful, Richard! Was it really tall or did you have to get close to the ground to get this? Whatever you did, it's really nice. nice shot, i actually like the angle of the shot and the way the grass towers over the greenery. Love the colors in this one, and the composition! Great light and nice angle make this a pleasing shot. I really like the lighting and the angle of this shot Richard. They look giant from this angle and golden against the blue sky. Richard, you have an amazing gift for capturing the beauty of sky and earth. I like the way the grass is lit by the sunlight, and it's perspective. Nice one! I like this grass very much. A very pleasing shot. Looks great against the blue sky. Perfect angle and composition! 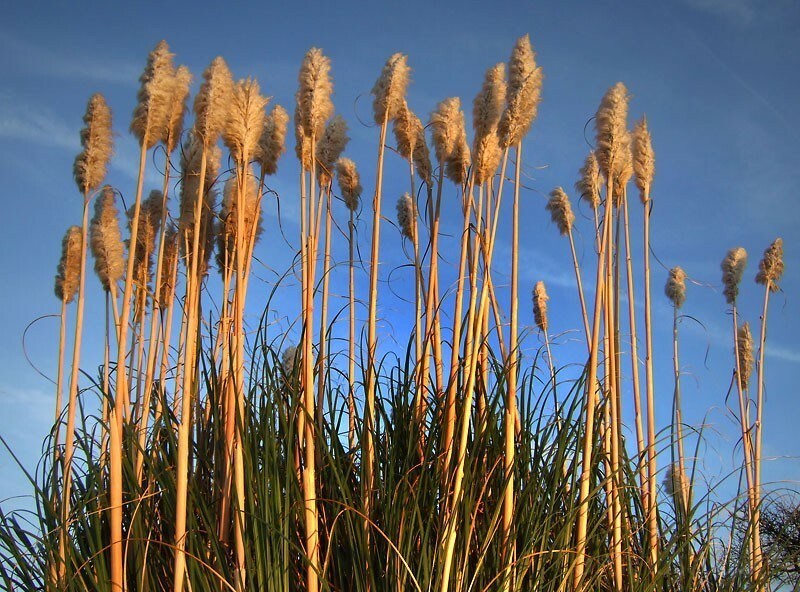 Wow, i didnt know these things are called the elephant grass. And i just love the blue sky...which I CANT get it over here. WOW! I love the point of view! The colors are magical - well shot image!! You can't beat that amazing light!! The golden tones just become so much more intense... This grass against that blue sky is really gorgeous!! Excellent, Richard!! Beautiful colors indeed. Wonderfully done. Great saturated color. Nice composition. It really has a very warm glow. Very photogenic these grasses, I favour them!They look so warm in that light and against the blue sky!